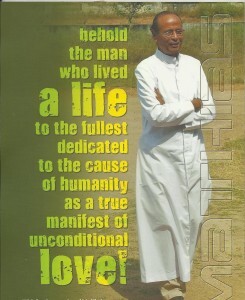 Cardijn Community International (CCI) has dedicated an exclusive website as a tribute to Fr. R. V. Mathias who passed away recently. We invite all those associated with Fr. Mathias to send in their testimonies along with pictures if any to be uploaded in the website. Glynis Joseph, X. Gnanaraj and M. J. Ruben represented CCI at the Memorial Service organised in Chennai on the 28th December. The General Assembly of CCI-India which met in Chennai on the 13th November 2011 came up with an action plan to study ‘the living and working conditions of the internal migrants’. CCI-India feels that this category of migrants needs special attention since not much is being done to address their problems. The General Assembly was preceded by a study on ‘Corruption’. Fr. Thomas Joseph, 92 yrs, YCW/CWM Chaplain since 1950 inaugurated the ‘immersion session’ on the evening of the 11th November and launched the official website of CCI-India. Fr. Maschio Mascarenghas conducted the ‘immersion session’. A training program for the youth on ‘Impact of Social Media and Social Networking’ is one among various activities planned for the next two years. The New Pentecost 2012 will be observed with the theme ‘Social Commitment of the Church’. The two year plan includes study and campaigns on unemployment, redefining work and worker, corruption, climate justice and peace building. A novel 3 year project titled ‘Vatican II @ 50’ is planned to commemorate the 50th anniversary of Vatican II. A National Forum comprising Cardijn movements, NGOs, lay and religious organisations and congregations, civil society organisations, individual activists, theologians, individual priests/nuns, bishops and others will be formed. The Forum will take up for its study, analysis and demands, two areas of the spirit and decisions of Vatican II, i.e. (i) social teachings including its social commitment and (ii) role and participation of the laity. The contribution of Cardinal Cardijn at the Vatican II will also be highlighted. A launch conference is being planned for October 2012. CCI wishes to seek the blessings and support of the CBCI in this meaningful celebration of 50 years of Vatican II. The following are the members of the newly elected National Executive Committee.